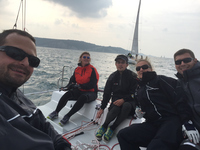 The beginning of the new sailing league on Fareast28 boats. Sky team is competing with two boats. I am sailing on the Sky Mama that managed to get two 1st places in the "small finale", therefore we were 7th out of 12 teams.